Another glimpse into the life of a wartime child and the unique record of her home-made dolls’ house and its contents. 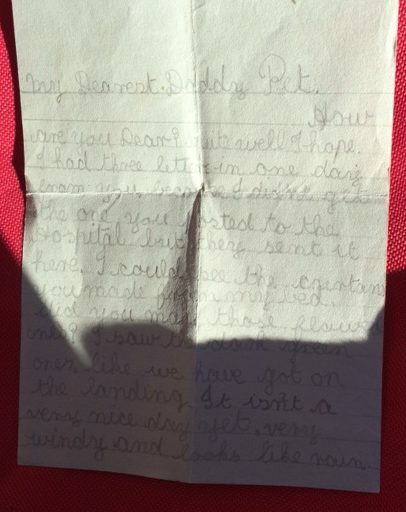 The following comes from a series of charming wartime letters, written by a little girl, Brenda, to her dad who was away during WW2. The letters were found on the pavement outside a charity shop, alongside a dolls’ house, and its contents. Many of the letters mention items still present in the dolls’ house. The house’s curtains are faded to light green, now, and silk, with a subtle red and white abstract pattern on them – probably a textile from Brenda’s home. They are ‘green’ as she mentions, but not ‘flowered’ so maybe there were two sets of curtains, one now lost. 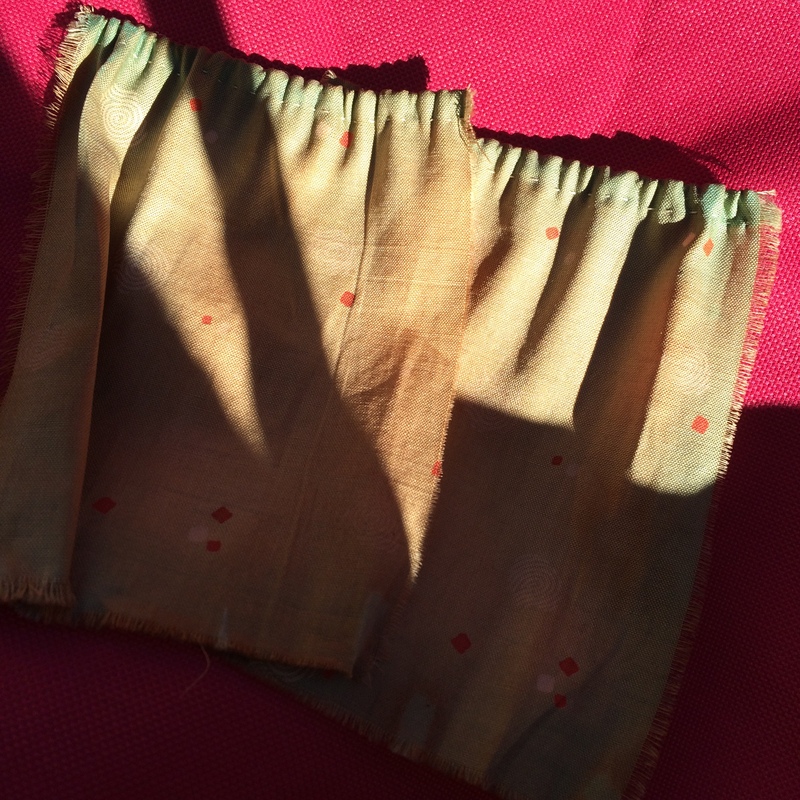 They were not hemmed, but a running stitch along the top, done with linen thread, attached them to some screws on the inside of the windows. Brenda seems to have been allowed to see the curtains her father made for her, whilst she was in hospital, having her adenoids and tonsils (“As and Ts”) removed, in the autumn of 1942. Brenda was 8, that year. 1930s’ and 40s’ Triang doll’s houses came with little strips of fabric, attached to the window panes, made from an equally fine silk or faux-silk, and these were probably roughly what Brenda’s father was replicating. According to my Ancestry searches, Brenda’s paternal grandfather was an upholsterer, so it’s not surprising Brenda’s father was accomplished with a needle. I will be carefully removing the curtains, giving them a gentle clean, and returning them to the inside of the house. One of the things that fascinates me about doll’s houses are the textiles. Brenda also mentions her doll’s “frock” and unpicking a “skarf” (so presumably that was knitted!) I will have to look through the extant dolls’ outfits and see if I can find a likely candidate – if I do, I’ll photo it. I have preserved Brenda’s spelling and punctuation, throughout. This letter is written in pencil, so I transcribed it. How are you Dear? Quite well I hope. I had three letters in one day from you, because I didn’t get the one you posted to the Hospital but they sent it here. I could see the curtans you made from my bed, did you make those flowered ones? I saw the dark green ones, like we have got on the landing. It isn’t a very nice day yet, very windy and looks like rain. I have done one side of my dollie’s frock and unpicked the skarf. I took Teddy to the Hospital. It took quater of an hour to take my As & Ts out because the nurse told me Mummy’s going to sit in the bed-room and sew. Grandma Leatherhead came to see me on Saturday. I hope you will like the drawing of a garden. A week to-morrow you will be home. Won’t it be just lovely, what a time we shall have to-gether. I have got a loose tooth. I am writing this letter in bed. the time is 5- twenty two and I shall soon be having dinner, I shall have fish and saygo pudding. Dr Eastern came to see me yesterday. It is very cold out to-day. Dickey doesn’t sing yet. I am writing on the paper you gave me. my throat didn’t hurt a bit only when I swallowed. we saw one of those big lorries in Leatherhead once. You ought to read JUST JAKE in the paper he says HANG IT HOW THE DEUCE D’YOU EXPECT AN ARTIST TO DO HIS BEST WORK WHEN THE MODEL KEEPS MOVIN’ ABOUT? On one of our regular dog walks, close to home, we pass a flock of Norfolk Horn sheep. They graze on a corner of Cawood Garth, a piece of common ground owned by the folk in the next village. It used to be where Cawood Castle stood (only the Gatehouse remains). This was where Cardinal Wolsey came to live, in 1530 but was here only a short while before Henry VIII had him arrested for high treason. He died on his way to trial in that vortex of doom that is Leicester. By all accounts he was very popular with the locals in Yorkshire and I grew up in a nearby village where every other street had the word ‘Wolsey’ in it. The Garth was rescued from developers when Greater Crested Newts and Star of Bethlehem wildflowers were found – there are also some old varieties of apple growing there. Norfolk Horns are an ideal breed of sheep used for ‘conservation grazing’ and the fact they are on the Garth is good news for its flora. I have many happy childhood memories of Cawood, where my mother grew up and her aunties still lived. 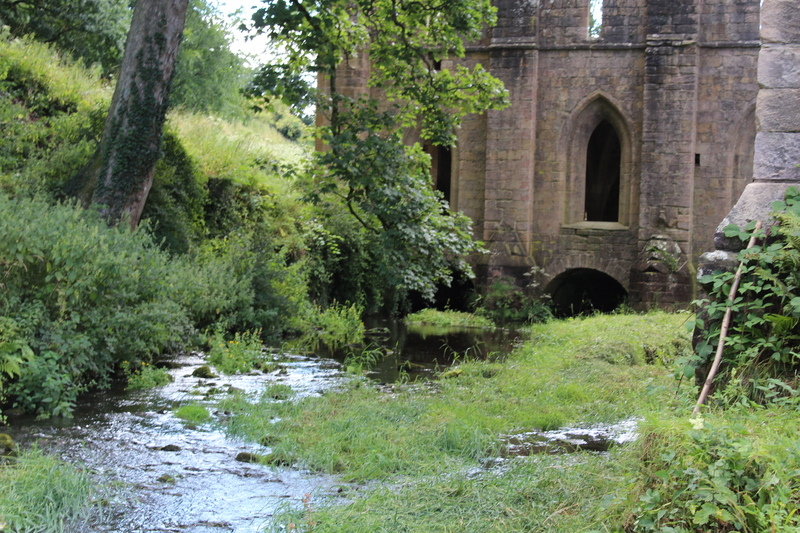 So to get some fleece from the sheep who graze there – and, of all places, on the very site where Cardinal Wolsey once lived – is a rare privilege indeed. My ancestor, Isaac Moses, left a piece of land in Cawood his will, in 1820, called ‘The Close’ which may have been nearabouts and he lived yards away at Market Square. This may or may not have been a bit of the Garth. Washing Norfolk Horn in a dolly tub. The wool is short-medium staple and mostly looks to be white, but one fleece has some grey and others grey bits near the margins where the sheep have markings. Fleeces were well skirted and rolled, and quality sorted. The wool looks to be a typical 54s-56s; and finer sections of the one I unrolled this morning had lovely crimp, and looked ‘lacy’ when held up to the light. The wool has a fair bit of grease, too. By another coincidence, they were stored in a barn on my Grandfather’s old farm, where my mother grew up, so it was strange going to pick them up and thinking “She once stood here and this was all where she played.” My mother would have loved to know one day her daughter would be standing there, buying wool. We sorted the fleeces, labelled them clearly and have stored them in the little loft of our shed – formerly the kids’ playhouse)so it had a tiny ‘upstairs’. I’ve put the best fleeces towards the front and will process in quality order, ensuring the better ones, at least, are stored clean before winter. The wool on the ‘moderate’ ones looks to be very lovely, as well, though. I’m also about to get a couple of Castlemik Moorit fleeces from a prize-winning flock. With all our efforts going towards covering the cost of shearing at the Museum of Farming, earlier in the year, it feels good to be doing something to keep the rarer breeds of sheep going, in another way. This will be a Norfolk-Horn crazed Spinzilla. I’m still dithering though, whether to enter Spinzilla – if I do, it will be as a Maverick. The year before last I was only 30 odd yards from winning the Mavericks, and as I hadn’t planned on entering the competition til the day before entries closed, I hadn’t cleared my schedule so lost a day of that week to appointments, and unavoidable things that could have been avoided with more notice! As I card and spin this wool, in the run up to Spinzilla (or Not Spinzilla), I’ll report back how it’s looking as I know this is a breed of sheep a lot of spinners haven’t had the chance to try. Our dye garden area had an impromptu fence around it. But apparently, the vikings had to urgently work on something that involved them being our side of the fence, and walking about on what they must have assumed were worthless ‘weeds’. In fact, the madder we were hoping to leave undisturbed another year or two. The weld – greatest tragedy – was two weeks or so off coming into flower. We have just grubbed everything up, hung it up to dry in the shed, and will see what colours we salvage, when we get time to dye with them. I would have had double the madder, I guess, leaving another year. Anyway, we’re now going to have to re-locate to a place where rampaging vikings won’t do a dance on our crop. (Quite ironic as they were doing ‘living history’ at the time but clearly with more of a 21stC sensibility where anything that isn’t petunias or roses = weeds…) The dye garden was 2 years’ worth of effort put in by four people. A shame to see it go. It will rise, phoenix-like, from the Viking pillage – but in a Viking-free zone. 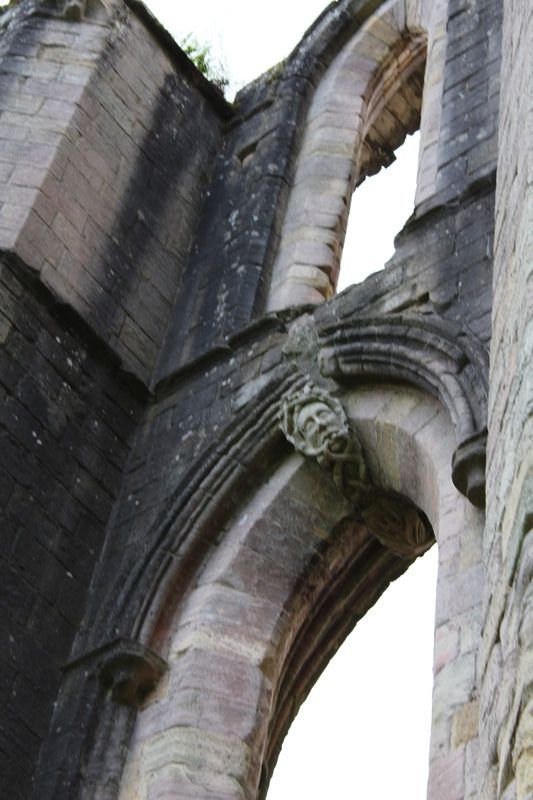 Talking of Viking-free zones, the other week, we were at the stunning Fountains Abbey, fettling their Great Wheel which is having some teething troubles. (Nothing major – a slight problem with the leather bearings). We’ve had the wheel fixed for them by an expert and will be returning the mother-of-all and spinning head, down the week. I’ve never fallen in love with a place on sight, so much as I have Fountains. Any excuse to get back there in the coming months, I think! I’ve been reading about its history. 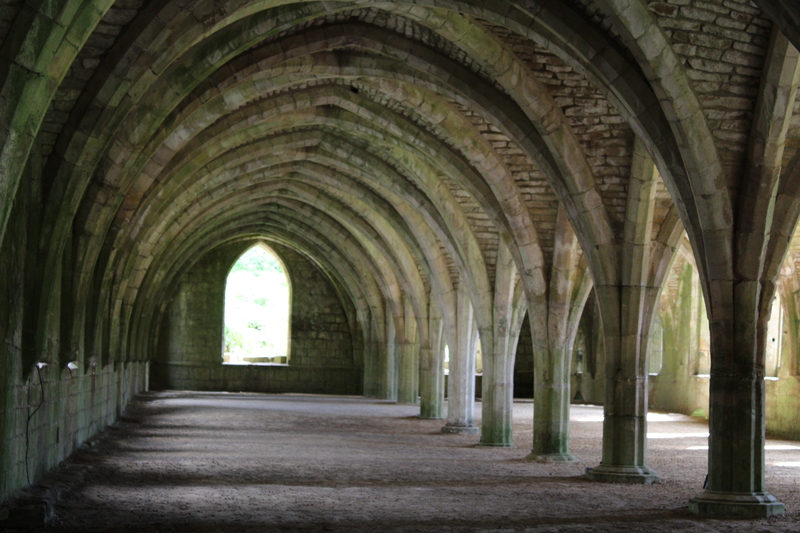 Only nine years after the Cardinal was captured, and marched away to die, Fountains Abbey was surrendered at the Dissolution of the Monasteries. At the moment, I feel like I’m living the monastic life in my own personal woolhouse; constantly washing and scouring wool, and now preparing to card it for spinning, during the autumn/winter. 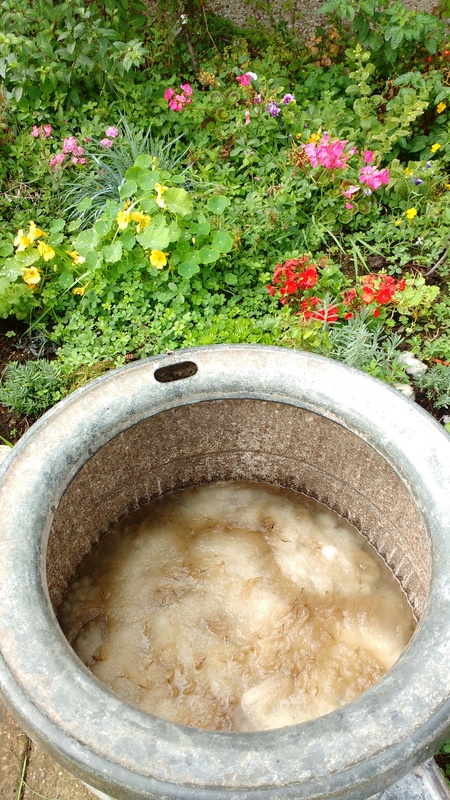 Sick of plastic bins splitting under the strain of wool washing, I hit upon the idea of using a dolly tub. Borrowed one, but it has to go back soon so I’ll be on the lookout for my own as it’s proving to be perfect for the job! Look out for us demonstrating spinning/Yorkshire Dales knitting at the Cawood Craft Festival, this weekend. We’ll also be demonstrating Dales knitting, the Great Wheel and/or the Chair Wheel at Masham Sheep Fair, 24th/25th September. Look out for us upstairs in the Town Hall! Have A Go On A Great Wheel Weekend! Tomorrow (5th August) and Saturday, we’ll be demonstrating the Great Wheel, at the British Wool Show, Murton, York. If you fancy some ‘Have A Go’ great wheel spinning, come along and try your hand at it. Very few spinners are left who can spin on the Great Wheel – we’re hoping to change that! You can also book a half hour workshop session, on either day, for a small charge to cover materials, wool preparation, etc. We have spent much of this week carding wool on the drum carder and will be bringing along some interesting British breeds of wool, including Whitefaced Woodland and some of our Badger-Faced Balwen for folk to try. We will also have a bit of raw wool available for sale, from the sheep at the Yorkshire Museum of Farming, next door to the livestock centre – money raised contributes to paying for the sheep to be sheared. (Below: One of the Museum’s Badger-faceds, from prize-winning stock and a close up to show you the quality of the fleece). On Sunday, we’ll be at the National Trust’s Nunnington Hall’s Traditional Skills day, with either the Great Wheel or the Chair Wheel or both if we can fit them in the car! Spinners and knitters please come along, and ask all your Great Wheel/spinning questions – and the braver amongst you; have a go on our wheel! Recently, I was privileged to be asked to do a very short talk on the history of ganseys, as part of the Autumn/Winter season launch at Baa Ram Ewe, in Leeds. “Knit Happy. Knit Yorkshire.” the sign on the shop says – now there’s a sentiment I can get behind. Sort of familiar territory, as a couple of years back, I sometimes rode shotgun with a very dear, departed friend, when she went to her hospital appointments in Leeds. To make the day bearable, she’d treat herself to a trip to Baa Ram Ewe when the treatment was over, and so I was introduced to the fantastic shop that was the old Baa Ram Ewe, in Headingley. I hadn’t been back since my friend died. In the meantime, the shop has moved to lovely premises on the Harrogate Road, in Chapel Allerton, and now has a lovely range of its own yarns, as well as some brilliant, Yorkshire-inspired, patterns and books. The new season sees the introduction of Dovestone Natural Aran, which has subtle gradients of natural greys, (anyone who is a spinner knows how difficult it is to maintain a consistent quality of yarn and simultaneously shift the colour along a gradient – I did it many years ago with some Jacob’s wool, here). The Dovestone is a mixture of Bluefaced Leicester, Wensleydale and Masham – all three are longwools with strength and lustre; the Bluefaced also has a softer, sort of buttery feel to it and is probably one of the most traditional of all commercial yarns in that the Victorians liked to use an ancestor of this breed in their knitting yarn. Which would make Dovestone eminently suitable for all kinds of traditional knitting, of course. Baa Ram Ewe have also added some new, vibrant colours to the Dovestone DK range (I’m hoping to try some out for a new gansey design, as this year I’m experimenting with using non ‘traditional’ 5 ply guernsey yarns, and as this has the lustre I love, I want to try it out). Best of all, they have published ‘Yorkshire Shores’, by Alison Moreton and Graeme Knowles-Miller. Regular readers here know that I believe there is no real dividing line between ‘real’ ganseys and ‘inspired-bys’. ‘Traditional’ knitting has always been a broad church; ‘traditional’ knitters didn’t always only use commercial 5 ply guernsey yarn; nor did they stick to a certain size needle. The only law is – there are no laws. Also, I have started wondering about using a wider variety of yarns. I’m all about Yorkshire history and Yorkshire knitting, using Yorkshire-made yarns. So this book was always going to appeal to me. At the season launch, we could see all the samples from the photo shoot – and these knits look as lovely ‘in the flesh’ (on the hoof?) 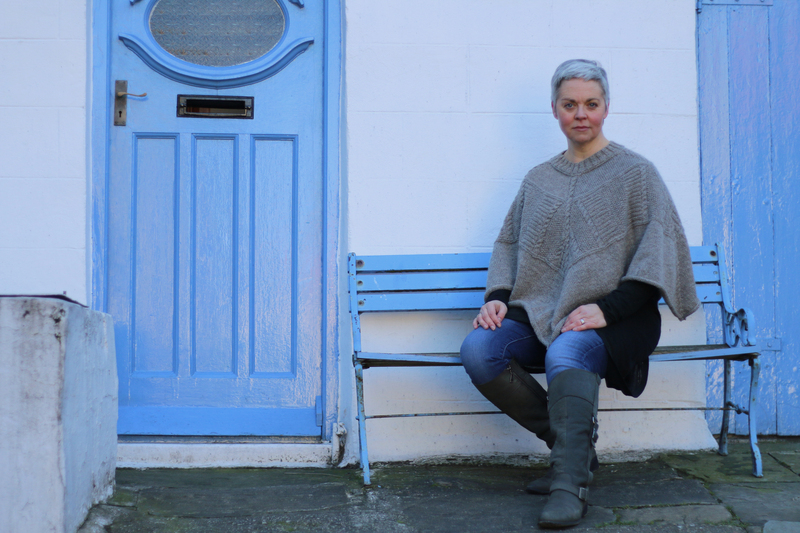 as they do in Joelle Trousdale’s images – which made me want to return to Staithes ASAP! 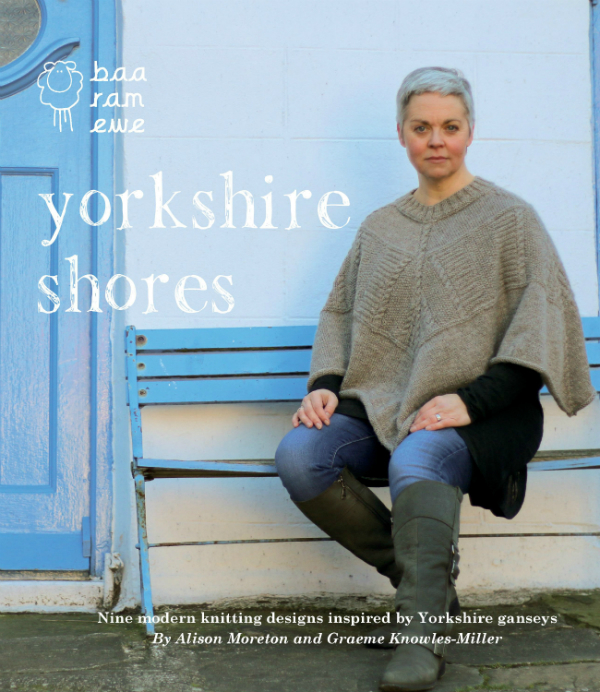 ‘Yorkshire Shores’ is sound on technique – and would be an excellent gateway drug to the stuff of absolute ‘traditional’ Yorkshire knitting. 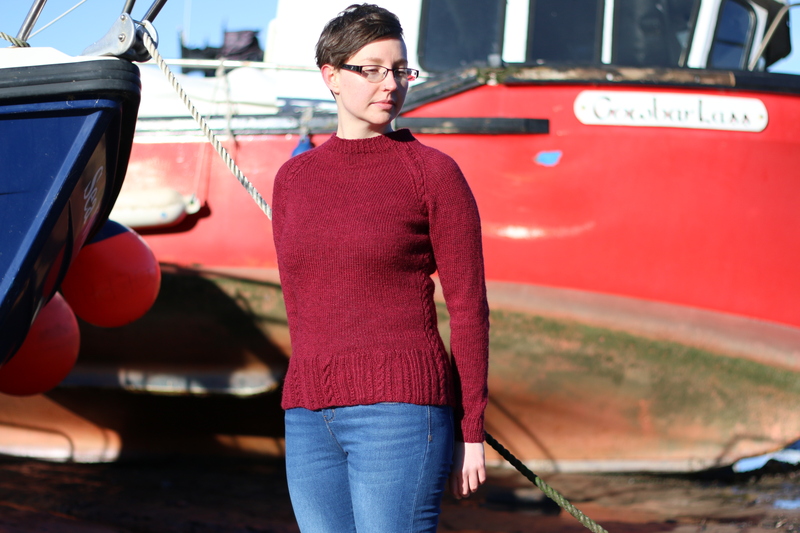 Not only the elements of design but also some of the solid techniques the designs walk you through, would stand you in good stead for any future gansey knitting. They both know their stuff. Special mention must go to my two favourite designs from the book. With ‘The Ropes’ Graeme has actualised a design I sort of had in my head for the past couple of years – but done it better! Not just me, but the redoubtable Freyalyn Close-Hainsworth (known to many for ‘Freyalyn Fibres’, although I first envied her work years ago via ‘Spin Off’ magazine) quite rightly fell in love with Alison’s ‘Flamborough’. On the way home, we realised the shop was about five minutes from the cottage where dad was born, on Bradley Terrace (near Roundhay Park). So we popped up there to say ‘hello’ to him, or rather, to see it for him. We had known Dad was dying for a few years, and when he got too frail to travel any more, right near the end, and now living in the Midlands, we went across to Birchwood Hill and Bradley Terrace, to take photos of his birthplace and the two houses on the adjoining road where both dad’s sets of grandparents lived. That was one of the last times I saw Bradley Terrace and I can’t think of it now, without thinking of the smile on Dad’s face when he saw it one last time, in our photos. It was a poignant day for all kinds of reasons – my first visit there since C died, without C. And also Bradley Terrace on the way home. Some of that probably accounted for the crashing migraine I had all day! But the little pilgrimage at the end of the day was something happy, not sad. I hope to return to Baa Ram Ewe very soon, and now have even more fond associations with the folk who ‘Knit Happy. Knit Yorkshire’. And Ay Up but I nearly forgot… For everyone born here in Yorkshire, those Yorkshire in spirit, and those who just love the history of our beautiful county… Happy Yorkshire Day, everyone!